Volubilis, near the Moroccan town of Meknes, situated between Rabat and Fez, was a central Roman administrative city in Africa from around the third century BC, built atop a previous Carthaginian city. Volubilis was unique in that it was not abandoned after the Romans lost North Africa to the Arabs, with even the Latin language living on in the area for several centuries. 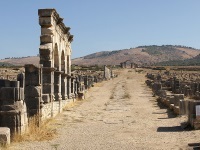 Volubilis remained inhabited until the 18th century, when it was demolished to provide building materials for the palaces of Moulay Ismail in nearby Meknes, which meant that a great deal of the Roman architectural heritage was lost. Today the ruins are a UNESCO World Heritage Site and consist of some well-preserved columns, a basilica, a triumphal arch and about 30 magnificent mosaics. It is recommended that you have a knowledgeable guide for this site, as it is greatly enriched by knowing the background and context of what you are seeing. It takes a few hours to stroll around all the ruins and visitors should be sure to come prepared for the baking sun as there is little shade - drinking water, sunscreen and a hat will make all the difference, and comfortable walking shoes are also essential.